Rev up your engines because you're in the driver's seat and a win in this drag race will pay off big time. Click here to play! Trophies, champagne and money await you at the finish line. Watch out for a green light and go! You're facing off against another driver, and if you manage to spin two or more of him, he'll pay off up to 10000 times your original bet. He also doubles the prize on any winning combination. Stick close to him and you'll win big! If you can collect two to five racecars, you'll get 2500 times your original line wager. Raceways are full of beautiful fans looking to get close to winners. If you can manage five of these beauties, you'll get 1000 times your original wager. Any drag racer knows that it's the green lights that really matter. Get two or more green lights and you'll be rewarded with up to 200 times your total bet. Three or more green lights and you'll trigger a bonus race in which you get to play for free games. It's an excellent way to maximize your winnings at the finish line as all prizes are doubled during free games. Take a seat behind the wheel and speed down the raceway for your chance to win thousands of dollars. Two or more green lights anywhere on the board act will trigger the scatter feature. You'll be rewarded with 200 times your total bet. The dashing driver with a victory wreath around his neck will substitute for all other symbols excluding scatters. Prizes are doubled when the driver appears in a winning combination. Five or more of him will pay out 10000 times your original line bet. 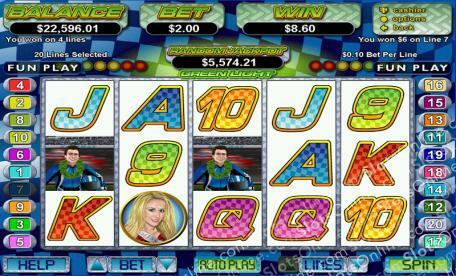 Three or more green lights will activate a Pick a Box style bonus game. You'll get to pick a car out of a line up. Your car faces off the others in a drag race for a chance to win up to 25 free games. If your car wins first or second place, another race takes place in which you are racing for up to 100 times your triggering bet. Prizes are doubled during the free game spins.